Producers’ Stocks are Moving – Will Juniors Be Next? Potash CEO’s often appear to have a Zen-like calm – and who can blame them? Like cats who own a mouse farm, they know the whole world is tilted in their favour. Potash, the key ingredient in fertiliser, is a monster story. Every year there are 75 million new people on the planet. The majority of this population growth occurs in the developing nations. As their middle class develops (by the tens of millions each year) workers require more protein, which means they eat more meat. This has an amplifying effect on the demand for fertilizer, because it takes about 10 kilograms of grain to produce one pound of meat. More people, less farmable land, requiring more fertiliser. Demand destruction? The eating business is about as solid as it gets. And this is why institutional investors love potash in a volatile market. The potash producers are seeing their stock prices rise, and this will follow through to the few juniors left – like Encanto Potash (TSXV:EPO) and Potash One (TSX:KCL). This last week has seen a number of significant developments which have caused the price of potash producers like, PotashCorp (TSX:POT), Mosaic (TSX:MOS) and Uralkali (LSE:URKA) to go up. Saskatchewan’s potash producers have announced combined investments of $8 billion to increase their total production capacity by 15.44 million tonnes by 2020. This will raise their total production capacity to 36 million tonnes. PotashCorp is investing about $4.8 billion in its Lanigan, Rocanville, Allan, Cory and Patience Lake facilities, while Mosaic is spending about $3.2 billion at its Esterhazy, Belle Plaine and Colonsay locations. They are anticipating strong long term demand for their potash. PotashCorp recorded a 46-per-cent hike in earnings per share in the first quarter of 2010 compared to the same quarter last year. Potash Corp, the world's largest fertilizer maker, is confident that the price of potash will begin a steady rise, as the demand-supply balance tightens over the next few months. The second piece of news is that Canpotex, the export arm of POT has agreed to sell 70,000 tonnes of potash to Sinochem Macao for $370 a tonne – a hefty 6% increase from the price they agreed on only last month. Analysts believe the new agreement signals that pricing momentum for potash is building. Inevitably, this bullish activity will ripple out to the juniors – of which few remain. 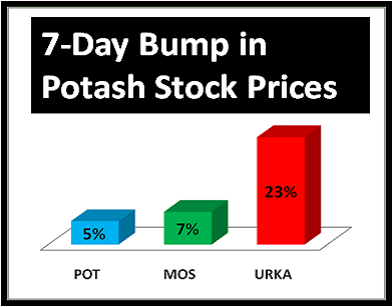 Encanto Potash, Western Potash and Potash One are the only Saskatchewan focused junior potash players still developing deposits. Encanto’s first drill hole at its Muskowekwan potash property in Saskatchewan returned values of 25.2% K2O (39.9% KCl) over 3.6 metres in the Patience Lake potash bed, and 25.5% K2O (40.4% KCl) over 2.4 metres in the Belle Plaine potash bed. This is the highest grade potash the industry has seen in years. Their potential mineable resource is worth about $200 billion at today’s potash prices. Encanto’s twist is that their potash is on First Nations ground –Encanto has 100% potash mineral title to all of the properties and the First Nations have a 3% GORR (Gross Over Riding Royalty) upon production. They say this will help speed development of their asset. There could be another cat in the mouse farm. Investors Guru Small Cap Stock Observer publishes interesting articles by contributing writers, in addition to its own content. This article was written by Guy Bennett and we have not verified its details.